Any web server should be configured to cope with large scale traffic. The amount of traffic your server receives depends on the popularity of the websites being hosted, the content they show, and how they have been developed. We wrote earlier about caching for database-driven websites to help reduce CPU overhead. Now we want to talk about bandwidth monitoring - helping you identify websites that may be needlessly using up a lot of bandwidth. Firstly, we make the assumption that the web host is also the web developer for the sites being hosted. This is becoming more common now, and we make this assumption, because this article talks about tweaking website content to optimize bandwidth usage. Firstly make sure logging is switched on in IIS. You can do this by going into IIS, then right-clicking in "Web Sites" and selecting Properties. You will now see a checkbox with "Enable logging" next to it. Make sure it is checked. Next you will need software to read the website log files and extrapolate bandwidth information from them. We use Live Bandwidth and find it to be adequate for bandwidth monitoring which breaks bandwidth down by website, and by time (individual days, or from date A to date B). We don't want to plug one particular solution, so you can see for yourself other solutions via a Google search : bandwidth monitor solutions found via Google Search. 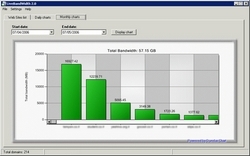 Any decent bandwidth monitor solution will breakdown bandwidth usage by website, and also by time. Bandwidth monitoring is about understanding how your server's bandwidth is being used by your websites, and identifying bandwidth wastage and reducing bandwidth by tidying up any websites that needlessly use up a lot of bandwidth.